This is yet another story of how our sprawling bureaucracy really stuffs things up. It begins fairly recently, in 2002, with the patented Akins Accelerator. Akins first came up with his idea while watching a documentary about World War Two in 1996 that showed twin anti-aircraft guns firing at Japanese warplanes from a U.S. Navy ship. Bill Akins saw the barrels sliding back and forth with each concussive recoil and wondered if he could design a device that would mimic that action. He did just that. In March, 2002, William Akins sent the ATF Firearm Technology Branch letters asking if his invention was legal. Bill Akins, both an ex-Marine and an Elvis impersonator, secured two letters from the Bureau of Alcohol, Tobacco, Firearms and Explosives (ATF) affirming the mechanism behind the device was legal, and poured his savings into the project. You might think that was that? You ask permission from your government if you can manufacture something, the government says “no problem” and you pour your savings into your invention. From Joseph Ax, Reuters: Akins’ device was intended to improve upon “bump firing,” a practice in which shooters fired from the hip while keeping a thumb hooked inside a belt loop for stability, using the gun’s recoil to activate the trigger more quickly. His innovation let users brace rifles against their shoulders in a more normal firing stance, improving accuracy and control. Akins put up his own property as collateral for a loan to launch the business. He estimated he sold several hundred devices, priced at more than $1,000 each, before he was shut down - not enough to cover his startup costs. He filed two unsuccessful federal lawsuits against the ATF, leaving him with a workshop full of unused Akins Accelerators. On November 22, 2006, more than three years after ATF's initial classification, Richard Vasquez, Assistant Chief of ATF's Firearms Technology Branch, sent a letter to Mr. Bowers stating that ATF had "recently received a request from an individual to examine a device referred to as an "`Akins Accelerator.'" Comp. Ex. H at 1. As a result of this request, ATF tested the Akins Accelerator and determined that it was a machine gun under the National Firearms Act, as well as the Gun Control Act of 1968. On January 19, 2007, ATF required the Akins Group and Plaintiff to remove recoil springs from all Akins Accelerators and surrender them to ATF, thereby rendering the devices non-functional and without value. In the case of Slide Fire, the ATF approved the device, long after the Adkins Accelerator ordeal. Richard Marianos, was ATF’s assistant director for public and governmental affairs when he wrote the letter to Rep. Ed Perlmutter, D-Colo., on April 16, 2013. In the letter, he stated that the two bump-stock devices — the HellFire Trigger and the Slide Stock of Slidefire Solutions — fell within the 84-year-old Federal Firearms Act’s distinction between rifles that require one trigger pull per shot (legal) and rifles that emit automatic rapid-fire bursts (illegal, or strictly regulated). These devices do “not provide an automatic action — requiring instead continuous multiple inputs (trigger pulls) by the user for each successive shot,” the Richard Marianos letter states. Trying to obey the law is apparently impossible, sometimes, in the United States. In 2002, the Adkins Accelerator was legal, according to the ATF. In 2007, it was illegal. However, according to the ATF in 2013 (and ever since), the Slide-Fire stock (similar to the Adkins but without the spring) and the Hellfire Trigger are perfectly legal items and completely unregulated. There are some state “bans” currently. New Jersey’s new bump-stock ban, which was approved in January, residents were supposed to destroy or turn in their bump stocks by mid-April. So far, New Jersey State Police say, they have not received a single one. Does anyone believe there are no bump-stocks in all of New Jersey? Right now, the ATF is working on a back-door bump-stock ban. 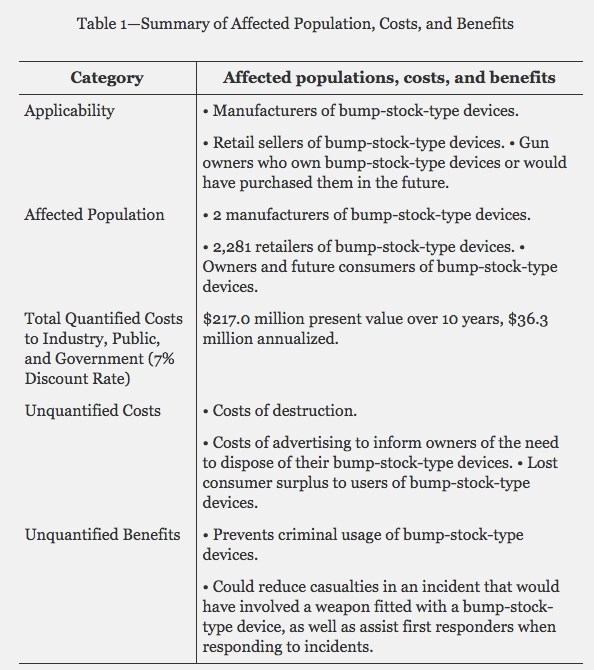 Note that the bumpstock ban, according to the ATF, has no quantifiable benefits. The stupid-stick has hit the ATF really hard. As to the unquantified benefit, "Prevents criminal usage of bump-stock devices," that is easy to quantify: that would be exactly zero. No one has ever been prosecuted for criminal usage of a bump-stock in the history of the world. Pressure cooker bombs, pipe bombs, and IED's are loudly banned . . . but no criminal usage has been prevented. For ten long years, we had a so-called assault weapons ban, the "Public Safety and Recreational Firearms Use Protection Act," not just obsessing over pieces of plastic. Criminals were unaffected by the ban and the entire ban itself didn't work. An evaluation of the short-term effects of the 1994 federal assault weapons ban did not reveal any clear impacts on gun violence outcomes (Koper and Roth, 2001b). To enforce such a law on a national level would require Federal Agents to become storm-troopers, going house to house, room to room, searching every nook and cranny for the 500,000 or so pieces of plastic purchased legally and owned ;egally, all with the written blessing of the ATF. Some might say, “Well, thank God for all of our sanctuary cities,” where Federal laws don't always mean that much. In 2015, more than 200 state and local jurisdictions did not honor requests from Immigration and Customs Enforcement to detain individuals, ICE Director Sarah Saldaña testified before Congress, and a subset of that group refused to give access to their jails and prisons to ICE. According to tracking by the Center for Immigration Studies, a think tank that advocates for restricting immigration and opposes sanctuary policies, roughly 300 sanctuary jurisdictions rejected more than 17,000 detention requests, between January 1, 2014, and September 30, 2015. It sounds like if you are an illegal immigrant with a bump-stock, you're golden. While we are busy decriminalizing things, perhaps we could find a little time to decriminalize the Constitution?